﻿ Quality Assurance | HONEST CO., LTD. The RAP brand carries with it a guarantee that its products are equal in quality to new products. 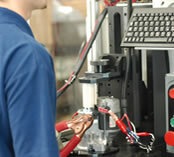 The RAP rebuilt component brand guarantees quality for 1 year (or 10,000km) to 2 years (or 40,000km). The 11 rebuilding processes, conforming to ISO9001 quality management system standards, use the technologies and know-how we have developed since our foundation to perform total restoration work. We apply strict, in-house quality standards in our final inspections, evaluating products from a variety of perspectives. HONEST’s other superior component brand, NAP, provides high quality sensors and other electrical components which can not be rebuilt. HONEST CO. plans to develop and designs those components, then manufactures them by contracting domestic and overseas top level manufacturers. Tests, from bench tests to field tests, are carried out, and we only ship the products which pass our strict tests. This dedication to quality is what produces our high level products, securing the trust and estimation of our customers. Electrical control units (ECU) are important components of automobiles, which are constantly growing more computerized, yet they are prone to failure. HONEST CO. is the first company in the industry to successfully rebuilt ECU, contributing to the supply of low cost, high quality products. We analyze ECU, whose design varies by car and specification, and use our own system, developed in-house, to perform installation simulations. Through this extremely accurate verification process, we ensure performance equivalent to the performance offered by new products. HONEST CO. has deployed the latest facilities and inspection equipment developed in-house in our head office plant, which began operations in 2001, and our new plant, which was expanded in 2005. We employ quality management and environment conservation measures thoroughly rooted in the ISO9001 and ISO14001 global standards. Rebuilt parts and core components from our RAP and NAP brands, which carry with them guarantees of quality, are exported around the world, to countries and areas such as America, Central and South America, the Middle East, Africa, and Asia. In February 2007, in order to improve our manufacturing capabilities and further reduce costs, we established a new factory in Vietnam. As a key overseas site, it primarily produces electrical components, which require significant technical skill, extending the global reach of our dependable, high quality products. HONEST CO. offers close, attentive support throughout our products’ lifecycles. Our dedicated call center staff provide accurate support not only for product orders, but for any problems or maintenance work which occur during product use. Our technical support division, composed of experienced maintenance staff, offer speedy advice concerning installation, failure prevention measures, and more. Thanks to our sales management system, which offers highly accurate traceability, everything from product searching to inventory confirmation, estimates, and orders can be performed instantly via our website. All of our services, leading up to the delivery of products themselves, are offered in a speedy manner, with no time loss.